Nikon has announced the world's first water-, freeze-, and shock-proof mirrorless camera, the 1 AW1. The camera's specifications are identical to the Nikon 1 J3. It has the same 14.2MP CMOS sensor with no optical low-pass filter, EXPEED 3A processor, advanced hybrid AF system, ISO range of 160 to 6,400, continuous shooting mode up to 15 fps, full HD 1080p video recording, and a popup (waterproof) flash. The 1 AW1 is also equipped with a built-in GPS system, Action Control, and a dual altimeter / depth gauge. The camera will be available for $799.95 (with a 1 Nikkor AW 11-27.5mm f/3.5-5.6 lens) starting October 10. 3. EN-EL20 dual battery charger. Today, Nikon Inc. announced the world's first waterproof, shockproof interchangeable lens camera1, the Nikon 1 AW1. Also designed to be freezeproof, the durable and versatile AW1 thrives in harsh environments while delivering the high-performance features and incredible image quality that thrill-seeking families need to capture every moment and memory. By land or by sea, from the tropics to snowy peaks, this newest addition to the Nikon 1 Advanced Camera with Interchangeable Lens System (ACIL) is equipped with outdoor friendly features to capture amazing photos and stunning Full HD video. "As the world's first waterproof and shockproof Advanced Camera with Interchangeable Lens System, the Nikon 1 AW1 offers an exciting new option for the family who seeks both exhilaration and a durable yet versatile camera to complement their active lifestyle," said Masahiro Horie, Director of Marketing and Planning, Nikon Inc. "The Nikon 1 AW1 and the new 1 NIKKOR lenses are always ready to capture the action with high speed performance and incredible image quality that users have come to expect from the Nikon 1 System." Additionally, the versatile Nikon 1 AW1 offers the unique feature set that adventurers of all levels can take full advantage of, whether tackling a black diamond slope or an unfamiliar trail. With built-in GPS technology, AW1 users can track their travels while identifying the exact longitude and latitude where an image or video was captured. The AW1 is also equipped with an altimeter, a depth gauge, an electronic compass and a virtual horizon indicator. What's more, the cameras pop-up flash is waterproof as well, allowing the user to add light to a scene automatically or on command. Featuring both a14.2-megapixel CX-format CMOS sensor and Nikon's EXPEED 3A image processing engine, the AW1 produces sharp, high-quality images and HD video with great detail and color, even in challenging lighting situations. The Nikon 1 AW1 also sports a wide ISO range (160 to 6400), allowing users to capture sharp photos in a variety of lighting, even while handheld. Swift performance and rapid response are hallmarks of the Nikon 1 System, and in similar fashion the AW1 includes Nikon's superfast and extremely responsive Advanced Hybrid Autofocus (AF) system that affords users the ability to capture incredibly fast moving action. To capture even the fastest moving subjects with clarity, the 73-point AF array can lock on to the action in approximately 80 milliseconds2. To help ensure that no moment is missed, the AW1 offers the world's fastest continuous shooting frame rate (approx. 15 frames-per-second [fps] with AF)3 and continuous shooting at 60 fps when the focus is locked. Furthermore, the Nikon 1 AW1 features an intuitive Auto Mode to help users frame the perfect shot with ease. The AW1 also comes equipped with Live Image Control, giving the user access to real time adjustments of Active D-Lighting, Background Softening, Motion Control and Brightness Control, which are displayed on the AW1's LCD screen prior to capture. When it's time for some aquatic action, the Nikon 1 AW1 offers several underwater controls. When in Underwater mode, users can choose from either three options (standard, scuba, close-up), which will automatically adjust the camera's settings to deliver optimal results based on the type of activity that a user is participating in. Additionally, the Underwater White Balance setting makes adjusting white balance simple, while the Underwater Distortion Control corrects the effects of distortion caused by water. For those who want to share their images from their latest expeditions instantly, users will be able to take advantage of the AW1's Wi-Fi capabilities. Similar to previous Nikon 1 System cameras like the Nikon 1 J3, the Nikon 1 AW1 is fully compatible with Nikon's optional WU-1b Wireless Mobile Adapter4, allowing high-quality images to seamlessly be transferred to compatible smart devices wirelessly. If using the free Wireless Mobile Adapter Utility application for Android™5 platform smart devices as well as iPhone® and iPad®6 mobile digital devices, AW1 users will have the ability to remotely take photos with the camera from a smartphone or tablet as well. Alongside the new Nikon 1 AW1, the waterproof, shockproof and freezeproof 1 NIKKOR AW 11-27.5mm f/3.5-5.6 and 1 NIKKOR AW 10mm f/2.8 provide two versatile lens options for the individual looking for a compact camera system that can keep up with their active lifestyle. When attached to the AW1, these lenses can handle tough conditions while being waterproof (up to 49 feet), shockproof (up to 6.6 feet) and freezeproof (down to 14° F). The compact 11-27.5mm is a lightweight yet durable lens that packs a 2.5x zoom (30-74mm equivalent) and is ideal for capturing landscapes and portraiture during a family's latest expedition. Portable and ultra-compact, the 10mm provides AW1 shooters with a wide angle of view, useful when capturing everything from sweeping landscapes to close-up action that fills the frame. Not to be outdone, the 10mm has a fast aperture of f/2.8, to capture special moments with incredible clarity and a soft natural background, even in challenging light such as dusk or when underwater. Demonstrating Nikon's commitment to the newly introduced waterproof, shockproof and freezeproof products, Nikon also introduced new accessory skins for the Nikon 1 AW1 and the 1 NIKKOR AW 11-27.5mm f/3.5-5.6 lens. To provide more grip, comfort and control when shooting, the new accessory skins provide extra protection while also adding visibility and personal flair to their Nikon 1 Camera System setup. The Nikon 1 AW1 will be available as a one-lens kit, with the 1 NIKKOR AW 11-27.5mm f/3.5-5.6 lens, and a two-lens kit with the 1 NIKKOR AW 11-27.5mm f/3.5-5.6 and 1 NIKKOR AW 10mm f/2.8 lenses. 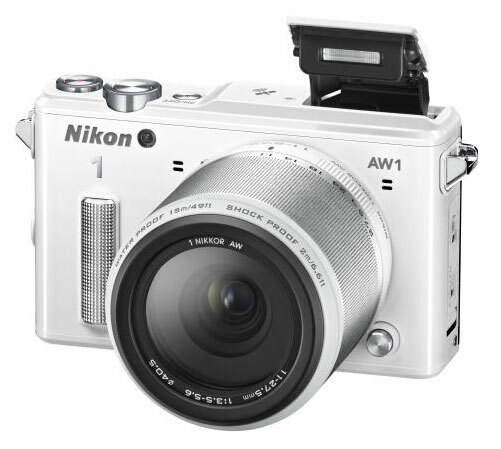 The Nikon 1 AW1 kit with the 11-27.5mm will be available in October 2013 for the suggested retail price (SRP) of $799.957. The Nikon 1 AW1 two lens kit with the 11-27.5mm and 10mm lenses will be available in October 2013 for the suggested retail price (SRP) of $999.957. To complement consumers' preferences, the Nikon 1 AW1 kits will come in three different colors including black, silver and white. Additionally, the new accessory skins for the AW1, 11-27.5mm lens and 10mm lens will come in a variety of colors including black, khaki and orange. These skins will be available in October 2013 for the suggested retail price (SRP) of $36.967. Lastly, the new Filter AW 40.5 NC attachment will be available in Spring 2014, though the suggested retail price (SRP) has not yet been announced. For more information on these new Nikon 1 Advanced Camera with Interchangeable Lens System products as well as other Nikon products, please visit www.nikonusa.com. Nikon, At the Heart of the Image™. Nikon Inc. is the world leader in digital imaging, precision optics and photo imaging technology and is globally recognized for setting new standards in product design and performance for its award-winning consumer and professional photographic equipment. Nikon Inc. distributes consumer and professional digital SLR cameras, NIKKOR optics, Speedlights and system accessories; Nikon COOLPIX® compact digital cameras; 35mm film SLR cameras; Nikon software products and Nikon sports and recreational optics as well as the Nikon 1 advanced camera with interchangeable lens system. Nikon Corporation, the parent company of the Nikon Inc., recently celebrated its 80th anniversary of NIKKOR optics, and announced the production of over 80 million NIKKOR lenses in 2013, creating a new milestone in Nikon's heritage of superior optics. For more information, dial (800) NIKON-US or visit http://www.nikonusa.com, which links all levels of photographers to the Web's most comprehensive photo learning and sharing communities. Connect with Nikon and other photographers on Facebook at http://www.facebook.com/nikon and get the latest news and information from Twitter by following @NikonUSA. With a comprehensive assortment of FX and DX-format lenses and focal lengths, from the ultra-wide 10-24mm to the super telephoto 600mm VR, Nikon photographers have come to rely upon the NIKKOR core technologies that contribute to their optical superiority. NIKKOR is the brand name for Nikon's photographic lenses, which are precision crafted to the most exacting standards in Nikon's own glassworks. In 1933, Nikon marketed its first camera lens under the NIKKOR brand name, the "Aero-NIKKOR" for aerial photography applications. Since then, NIKKOR has been used as a brand name for Nikon's lenses that symbolizes durability, high image quality and optical excellence. 1Among digital cameras with interchangeable lenses available as of September 9, 2013 (according to research conducted by Nikon Corporation). 2Among digital cameras with interchangeable lenses available as of September 9, 2013 as determined by Nikon performance tests; measured when using the single-point AF mode and the shortest focal length of 1 NIKKOR VR 10-30mm f/3.5-5.6 (according to research conducted by Nikon Corporation). 3Among digital cameras with interchangeable lenses available as of September 9, 2013 (according to research conducted by Nikon Corporation). 4The Wireless Mobile Adapter Utility Application must be installed on the smart device before it can be used with the WU-1b Wireless Mobile Adapter connected to the Nikon 1 AW1. The application can be downloaded free of charge from Google Play™ or the Apple App Store. For use with Android or iOS mobile devices, please refer to mobile device compatibility and available features at https://play.google.com/store/apps/details?id=com.nikon.wu.wmau&hl=en (Android) or https://itunes.apple.com/en/app/wireless-mobile-adapter-utility/id554157010 (iOS). 5Android and Google Play are trademarks of Google, Inc. 6iPhone, iPad and iTunes are trademarks of Apple Inc., registered in the U.S. and other countries. 7SRP (Suggested Retail Price) listed only as a suggestion. Actual prices are set by dealers and are subject to change at any time.